When Oklahoma natives Wathina and Chuck Luthi married in the late 1970s, it made perfect sense that they would pursue careers in agriculture. After all, they’d both grown up on family farms, and their love for the agricultural industry ran deep. The couple has passed that passion down to their sons, Bert and Alex Luthi, and as a result, their operation is sure to stay in the family for at least another generation – and hopefully many more to come. Shortly after Wathina, whose family has farmed in Oklahoma since the early 1900s, married Chuck, the couple began raising pigs in the Woodward area, starting with just two hogs in 1979. Their herd quickly grew, and before long, the Luthis relocated to join Luthi Family Farm, which has been in Chuck’s family for more than a century. As their business expanded – eventually including 3,650 sows – Wathina and Chuck worked to keep the farm economically and environmentally sustainable, and they developed an innovative animal waste system that earned them one of four National Environmental Stewardship Awards from the National Pork Board in 2004. 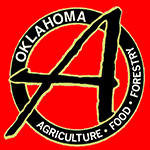 The family also received the Oklahoma Pork Council’s first environmental stewardship award. Today, Luthi Farms is a farrow-to-wean operation that’s a contract grower and production partner with the Maschhoffs, a fifth-generation family business in Illinois owned by two brothers. Wathina, who was recently recognized as a Significant Woman in Agriculture by the Oklahoma Department of Agriculture, Food and Forestry, says the farm is now home to approximately 4,900 sows – all expertly cared for and raised indoors. “We’ve found that raising pigs indoors is much better for them, as well as our employees, because everyone is protected from unpleasant weather and wildlife, and we’re able to provide individual, quality care for each pig,” Wathina says. Although Wathina and Chuck are still involved in Luthi Farms, their sons have largely taken over the operation. Bert lives nearby and works on the farm full time, while Alex, who lives near Oklahoma City and works in the oil industry, helps out on an as-needed basis. Alex, who considers himself the farm’s “mechanic on call,” primarily serves the family business by repairing equipment and helping make smart decisions when it comes to purchasing new machinery. Dairy is advancing with ag technology.